A package of hot dogs and a roll of pizza dough and you have a fun and delicious appetizer for your party or for your family. Mini Mummy Dogs are easy to prepare and have a crispy outside from the baking soda bath but are tender inside just like a soft pretzel. I have been obsessed with all things soft pretzel related lately. Don’t ask my why. I mean, other than they’re fabulously delicious with their crispy exterior and tender inside. And the fact that they’re typically served with pub or beer cheese. Who wouldn’t love that? I’ve tried my hand at making a few soft pretzels. I made German soft pretzels as part of #FreakyFriday. And since I had leftover dough, I made some pretzel hot dog bites. 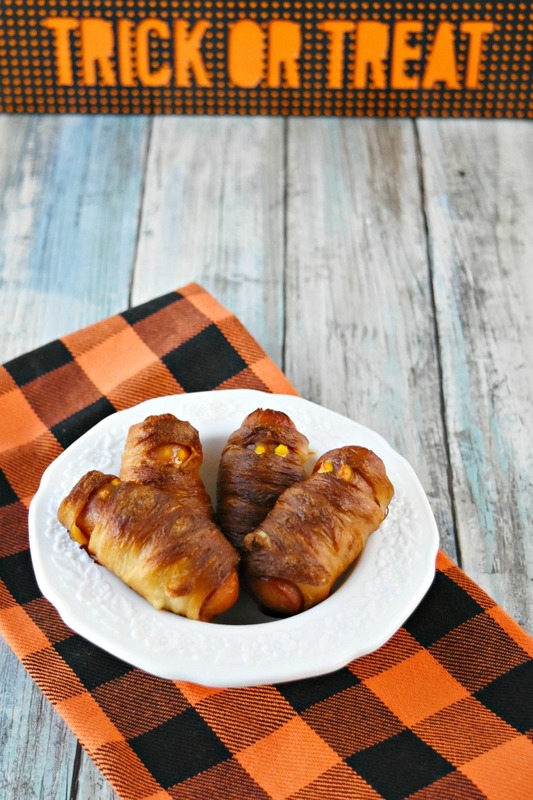 Finally, a couple of years ago I made pumpkin soft pretzels as part of #PumpkinWeek. Only three? I guess so! These weren’t meant to be pretzeled. Is that even a word? Pretzeled. It’s like pretzel is a verb and I’m taking some kind of action. I guess it is because I’m not getting a typo squiggly. But as I was sitting there looking at all that leftover pizza dough I had to do something with it. I hadn’t planned on making pizza. But I was thinking, “It’s just a basic dough. Why couldn’t I turn the rest into soft pretzels?” So, the experiment commenced. I know, you’re asking yourself why I would have so much dough left if I used all the ingredients in the recipe. Well, I didn’t use all the ingredients in the recipe. There’s just two of us and I didn’t have a party to go to. So, I just made 4 of those little delicious suckers. That’s why I had so much dough left over. It would have been wasteful to discard it and why couldn’t I make pretzels out of the rest of the dough? Seriously? It’s just dough. Pretzel dough isn’t that much different from pizza dough which isn’t much different from a basic dough. Dough is dough unless you’re looking for a brioche or sweet roll dough, then that’s a little different. Of course, I’m not master bread baker, but I’ve tried my hand at baking different kinds of bread. I fail miserably most of the time, but I keep trying. Which means I read lots and lots of recipes to figure out what needs to go into the dough I’m trying to make. This is what they looked like when they came out of the baking soda bath. Kind of we’re and all gummy, right? And the dough was pretty gummy. At this point I was worried. I thought for sure I had screwed this one up and I would have to try again. But I plowed on through my experiment. For the rest of the dough, I just made 6 inch sticks out of the rest of it making sure to seal the seams as I tried to roll them out. They went into the baking soda bath and baked with the mummy dogs. It was one and done experiment. If this failed, then I had a backup plan. Of course there was a backup plan. There’s always a backup plan. I didn’t, however, have a backup plan for the failed mustard eyes. I should have put some in a sandwich bag and dotted them that way. Instead, I tried a toothpick dot, but that didn’t work. Then I tried a chopstick to try to dot the eyes but that didn’t work either. They looked good for a minute, but I guess I didn’t let them cool enough. So, let them cool before adding the eyes. I was thinking it would be kind of different and a little creepy to have ketchup eyes with mustard centers or vice versa. I thought it would make them look even more creepy. Not that these look creepy except for the eyes. Other than that, they’re cute and scrumptious. Even the hubs had to taste one as we were cooking dinner last night. He’s like, “They taste like a pig in a blanket.” Yeah, that’s kind of what I was going for, but only with a mummy style wrapping instead of a straight wrap around the hot dog. He’s so funny sometimes. You always need the prerequisite taken a bite out of shot. At least I think I do. And I had to take a bite out of these. Of course it wasn’t very photo worthy to try to show you what it looks like bitten because, well, it’s just a hot dog wrapped in dough. Duh! This was a successful experiment, though. The pretzels sticks had more pretzel style flavor and texture than these mini mummy dogs did. They are crispy on the outside and the do taste delicious. But then again, I think anything with hot dogs in them is delicious. So, I’m biased in that respect. Make sure you see what the other bloggers have experiment with today! A package of hot dogs and a roll of pizza dough and you have a fun and delicious appetizer for your party or for your family. 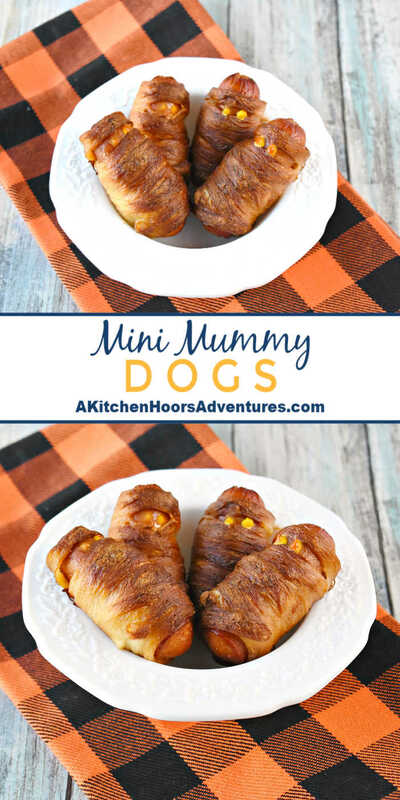 Mini Mummy Dogs are easy to prepare and have a crispy outside from the baking soda bath. Using a pastry cutter or a pizza wheel, cut the pizza dough into 24 long strips. Wrap the hot dog halves with the pizza dough. Place on a baking sheet lined with a silpat mat or parchment. Bring a pot of water to boil. Slowly and carefully add the baking soda to the water. If you’re not careful it will bubble and boil over. Carefully place the 4 to 5 mummies in the water and boil for 30 seconds on each side. Place on the baking sheet and repeat with remaining mummies. Bake at 400 for 15 to 20 minutes or until golden brown. Cool slightly before dotting with mustard eyes and serving with ketchup, mustard, or your favorite dipping sauce. I think these turned out great, eyeballs and all! Thank you! They definitely were delicious. Of course, anything with hot dogs is in my book. So adorable! These baby mummies need a little crib, maybe made of a big crack with pretzel sticks and something to hold it together. And a big mummy mommy! I love that you “pretzeled” these and yes….I think you should patent that word. I think I could live on soft pretzels. I LOVE them! !